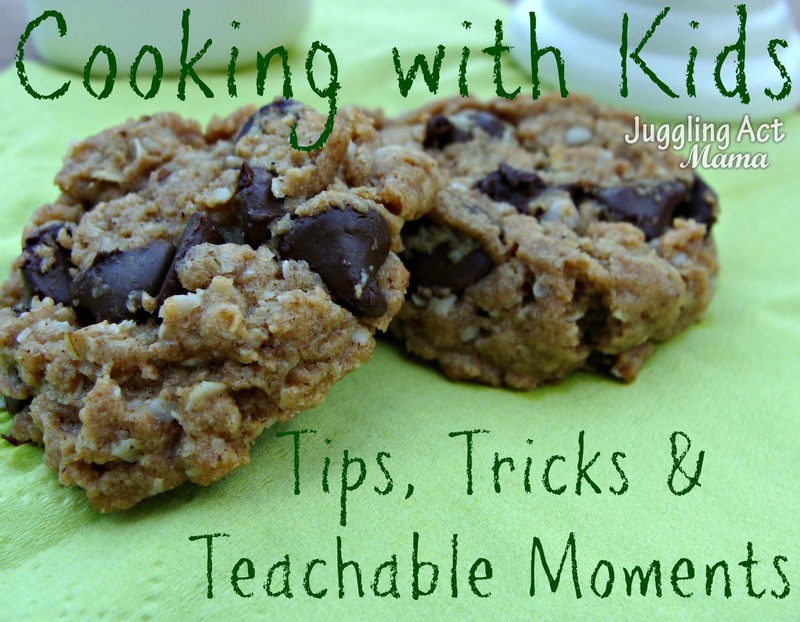 I really enjoy baking for my kids, but even better, I love baking with them. Yes, its messy; yes, it takes longer. 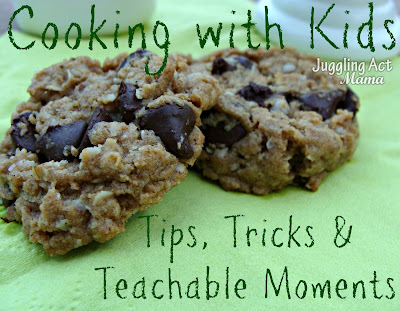 It’s just one of those things you have to juggle as a mom – but there are so many teachable moments and skills when you’re cooking with kids. For my two-year-old, there’s lots of opportunity for sensory play and hand-eye-coordination, as well as colors and counting. Scooping, mixing, dumping, and stirring are all great fun. Oatmeal Sensory Play is one of Olivia’s favorite activities. To avoid having mis-measurements in your recipe, give your little one their own mixing bowl and spoon. Talk about the different colors and textures – the flour is white and soft, the sugar is brown and crumbly, the peanut butter is sticky. Use the chocolate chips to practice counting, and as a reward for good listening! For my five-year-old, there’s even more precise hand-eye coordination skills, as well as measuring skills, simple math, letter and word recognition – leveling the flour, measuring ingredients, and cracking eggs are all great teachable moments. Have your preschooler/kindergartner help you find the ingredients by looking for the spice that starts with C. Use a smaller measuring cup than needed to make a small math problem – 1 ‘scoop’ plus 1 ‘scoop’ equals 2, etc. 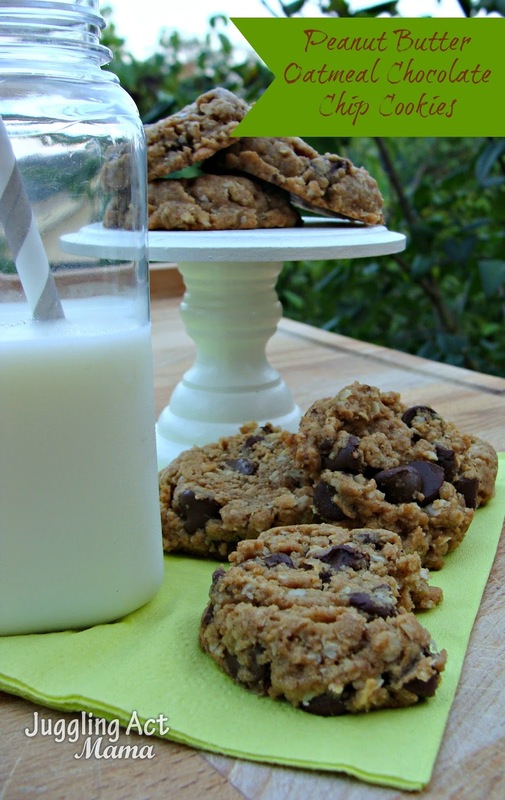 Now, this recipe is a combination of my three favorite cookies – the classic chocolate chip, with oatmeal, and peanut butter. They are so, so good. 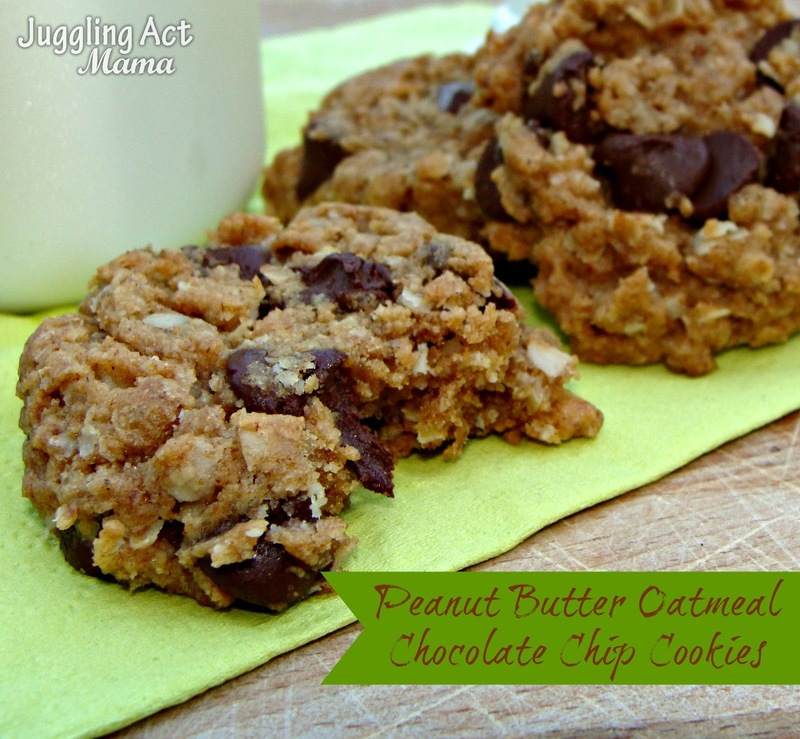 They are soft like peanut butter cookies should be, and a little chewy like a good oatmeal cookie. The whole wheat flour, oats, and ground flax seed are wholesome ingredients that make this a healthier treat than some others of it’s kind (especially store-bought!) You could use dark chocolate chips if you want some extra antioxidants. You’re going to just love the way these cookies smell baking in your oven, and even more the way they taste after a long day or work and school! Bonus tip – the dough freezes great, so double the batch and throw half in the freezer for another day! Preheat the oven to 350-degrees and line your baking sheet with parchment paper. In a small bowl, combine the butter and peanut butter. Microwave about 1 minute until melted, and stir to combine. Beat in the brown sugar. In a medium bowl, beat and egg with the vanilla. Stir in the mixture from the small bowl. Now add all of the dry ingredients and mix well. Fold in the chocolate chips. Now, my new trick to making the kids really happy? I use a 1/2-inch cookie scoop ((You can also use a tablespoon if you don’t have one) and roll small balls of dough, then gently flatten with the palm of my hand. The cookies end up being about two bites for grown ups – and are just right for little hands. Bake 8-10 minutes until the edges are golden brown. Let set 2 minutes before removing to a cooling rack. Serve with a class of cold milk and watch your kiddos grin ear-to-ear while munching on these yummy cookie!